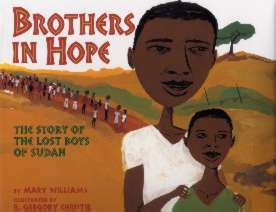 Brothers In Hope: The Story of the Lost Boys of Sudan, a Coretta Scott King Illustrator Honor Book in 2006, is fascinating and moving. Mary Williams worked with the Lost Boys and compiled this book from conversations with them. It is based on their experiences during the civil war in Sudan during the 1980s and 1990s. The book follows 8-year-old Garang, who loses his family and meets the other Lost Boys on the road to Ethiopia. There were more than 27,000 Lost Boys in reality, they were all out tending to cattle in the fields when their various villages were attacked. They walk from Sudan to Ethiopia, are forced back into Sudan when civil war breaks out in Ethiopia, and then walk to Kenya. Garang grows up during these years of displacement and becomes a leader looking out for younger boys and helping them survive. Eventually, he becomes one of almost 4,000 Lost Boys relocated to America for a chance at education and a better life. There were a few moments with this book when I felt that the America Saves the Day vibe was a little strong. All the missionaries the boys meet are American, and the US is presented like the answer to the Lost Boys’ prayers–literally. Were we the only country to take in these refugees? I found through Wikipedia that at least Australia also has an association for Lost Boys. I know there are other countries who took in refugees during this atrocity. However, these details aside I thought this was an incredibly powerful children’s book for addressing a terrible moment in human history from an angle that is accessible to kids. We are never told that the families are killed, just that they are lost and never returned. The illustrations by R. Gregory Christie are captivating, and Williams includes facts at the beginning and end of the story to flesh out the realities. This is a great title to have in a collection.